Since I feed a rotational diet, my brand loyalty can be a fickle thing, but The Honest Kitchen is one of my favorite companies around, and one I don't rotate from for The Ginger Sisters' breakfast. We change recipes by the box, but I don't switch brands for this meal. 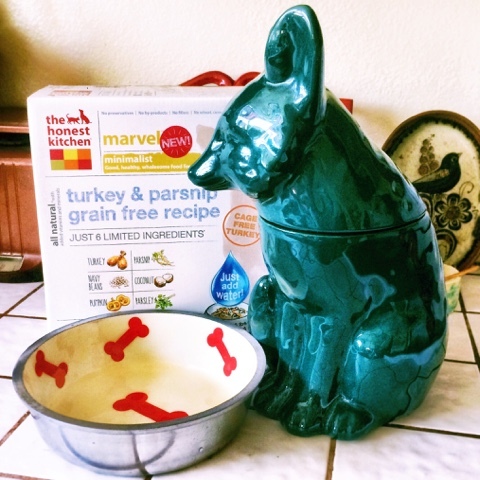 As the only human grade dog food on the market, I believe it's one of the very best. Since I've been protesting weekly in front of a local pet store that sells puppies with a group of wonderful, dedicated women, I've done some of my own research on the store and puppy mills in general so that I am an educated advocate. I'm learning about all the tricks that the proprietors of these kind of stores use to dodge questions about where their puppies come from. Breeders that care about their dogs do not sell them to a third party and a fate unknown. Period. Breeders that care about their dogs interview potential families and ensure a perfect match is made, very often with a contract to return the dogs to them if it doesn't work out and a lifetime promise of commitment to the dog they brought into the world. They don't pack them in crates and ship them across state lines to be unloaded in the parking lot of a strip mall and sold to people they will never meet. When a pet store employee says "reputable breeder" they are just telling customers what they want to hear in order feel better about buying a pet store dog. Don't buy the lie. The USDA governs the agricultural industry, and in their eyes, the dogs housed by large-scale commercial dog breeding operations are nothing more than livestock. Their regulations are absolutely minimal, the numbers they allow are mind-boggling. What does a USDA licensed breeder look like? I looked up the inspection reports for a breeder known to supply dogs to the pet store we have been protesting. Their most recent report was not completed due to "no responsible adult on premises." In years past, they had violations for dangerously sharp chewed water receptacles, improper shelter and too many dogs in one enclosure. Their recorded number of adult dogs and puppies was over 300. How can 300 dogs possibly be given the individual care and attention they need? It's simple - they can't. For a dog to be registered with The American Kennel Club, it needs to be the product of two AKC registered parents. That's it. The AKC does nothing to ensure that the dogs are healthy, that the facilities are satisfactory, or that the puppies and their parents are treated humanely. While they claim to inspect high-volume breeders, some who have passed AKC inspections have later been convicted of animal cruelty. In fact, as explained in the documentary Dog By Dog, the AKC regularly fights legislation to improve conditions and increase oversight of commercial breeders. When I was in college, I traveled with my mom and aunt to the home of an Airedale breeder near Santa Fe, New Mexico. We'd just lost our German Shepherd mix to a rare form of canine leukemia at the tragic age of 2 1/2 and our family had always had Airedales so she was interested in getting another. It's shocking that the woman allowed us to come to her home - while not a puppy mill per se, the AKC registered dogs were kept in cramped, dirty kennels outside, the puppies had runny eyes and crusty noses and all the dogs were miserable in the desert heat. It was heartbreaking to leave them there, but we walked away. My mom was not about to buy a sick puppy after recently losing our last dog. She adopted our heeler mix, Scout, from the Santa Fe Humane Society instead. My mother later reported the breeder to the AKC and was told there was nothing they could do. Pet stores often offer a limited health guarantee for puppies purchased from them. Why? Because they know there is a good chance the dogs they sell will have parasites, respiratory infections or other viruses due to the cramped, unsanitary conditions they are coming from. Many of the reviews for the local pet store we are protesting spoke of health issues. Much to my surprise, some of these reviews were positive overall. The customers were satisfied that the store had paid their vet bills, instead of questioning why their expensive eight-week old puppy was already sick. One reviewer even described the hypoglycemic seizures her new puppy suffered because they did not properly follow the store's instructions to feed Karo syrup to the dog. Are you angry yet? If you want to do something about it, spread the word. As part of the dog obsessed community, it's easy to forget that the general public are easily swayed by the pet shop double-talk. Join or form a local protest group, speak out when and where you can. I was so happy to learn of the group in my area, and seeing the documentary Dog By Dog was the impetus I needed to get my feet on the ground. Some days people talk to us, other days they ignore us, but changing just one person's mind makes it all worthwhile. Keep an eye on local legislation for regulating dog breeding and pet store sales. 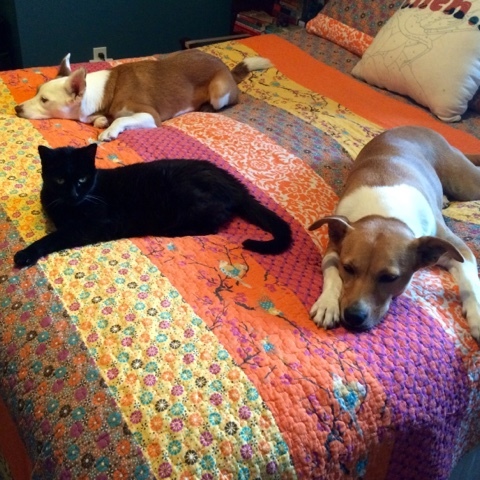 Phoenix, Arizona, recently banned pet store sales of dogs and cats from commercial breeders. I hope that it's only a matter of time before this touching video is the reality in every pet store, and dogs are no longer stacked, stored and shipped like merchandise, but instead cherished and cared for like the treasures they are. 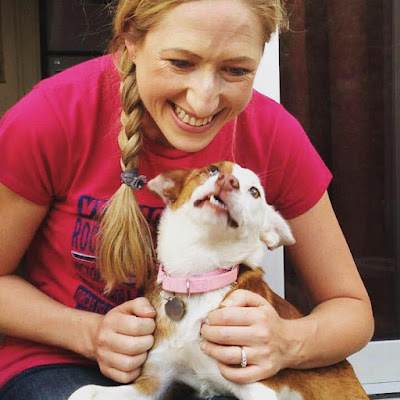 I learned about Teespring from Kimberly over at Keep The Tail Wagging. You can design your own shirts for fundraising or just plain fun. So, really, this was just an excuse to create t-shirts that I want myself. I am also raising money for The Humane Society of Grand Bahama with the "Ask Me About My Potcake" shirt. The leaves are changing, the kids are going back to school...summer really is drawing to a close. These past few weekends I've been taking full advantage of the last of these long, warm days and enjoying the natural beauty of my home state. I have every other Friday off, giving me a great opportunity to take Ruby on hiking trails that would be too crowded on the weekend. I wanted to decrease the number of people we encountered as much as possible, so after perusing hiking books and trail websites I decided we would make the long drive on Highway 285 to the Lost Creek Wilderness area and hike for a ways on the Goose Creek Trail (a 24 mile backpacking loop if completed). My dad was able to come along as well, which I was grateful for because the road was more rugged than I expected and he ended up doing some of the driving. My little Impreza got a true Colorado Subaru initiation on the steep, washed out Forest Service road and we were certain we were lost no less than five times. Two and a half hours from the city on back roads and we still arrived to a fairly full parking lot, but my remote destination was successful in that we only met a few other hikers and two other dogs at the very end of our hike. They were taking a different fork of the trail so it was easy to pick Ruby up and turn her away until they were out of sight. Boca seemed much more comfortable than she did on her solo hike the previous weekend - she liked having her scrappy sister along. She was my dad's charge for most of the hike, although if we were in the lead she pulled to stay close, so I took both girls at times. We crossed back and forth over the creek six or seven times and Ruby was such a champ about scrambling over the log bridges or hopping from stone to stone. Everyone got their feet wet at one time or another. 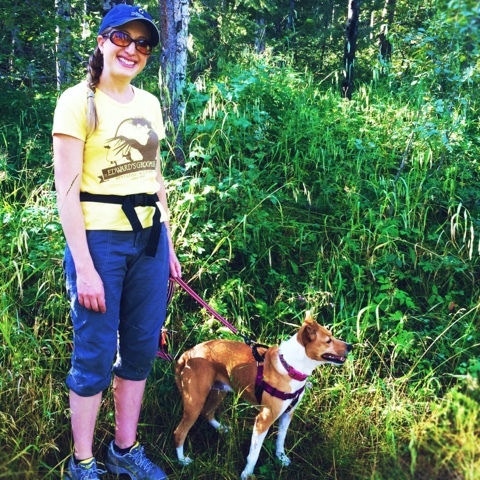 I had a hands-free leash system for Ruby (along with several back-up safety measures) which was really nice. It was a warm day and we didn't have a lot of shelter from the sun due to the area still recovering from the 2002 Hayman Fire - we drove through the burn scar for much of the way. Ruby and Boca were both wary of the other hikers we passed - most were carrying big frame-packs and/or walking sticks and they just didn't know what to think of those unusual silhouettes. One pair of hikers passed us as we were stopped for lunch and Ruby did the most barking at them, I think because they had a lot of equipment jangling which Ruby associates with dog tags. All in all it was very manageable and we were lucky that we didn't meet anyone at creek crossings or narrow places. I made the girls some doggie "trail mix," a combination of several different kinds of treats, and we also shared our string cheese and carrots with them. 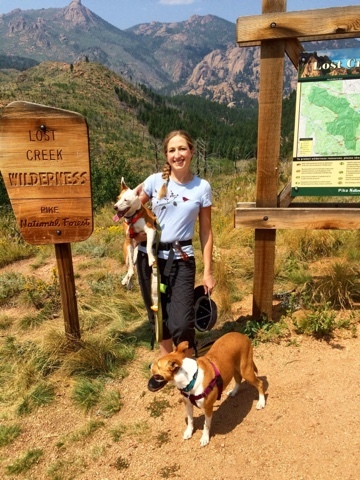 They had their own water bottle and I think next time I will have Boca pack out the poop bags in our Outward Hound pack. The Ginger Sisters seemed like they enjoyed themselves. We hiked for about two hours and even the Border Jack was slowing down slightly by the end. Ruby did some serious digging in the rich, black mountain soil and managed to coat the entire white side of her face with dirt. I thought it was well worth the long trip and would like to explore the area again sometime. Ruby rode wonderfully in her travel crate, although she was sick on the way up (the road was so bumpy and windy, I can hardly blame her!) - that was definitely one of the best dog purchases I've ever made. Boca slept the entire way home and didn't want to move the rest of the evening - little did she know there was another adventure in store for her the next day! The next day Boca and I set out for Elk Meadow, an off-leash wonderland in Evergreen, about thirty minutes from Denver. I'm not a huge fan of dog parks in general - I think they can be recipes for disaster and there are too many unknowns for this control-freak; however, Elk Meadow is a true gem. I had been there once before for last year's Colorado Potcake Meetup, organized through a Facebook group that I started. 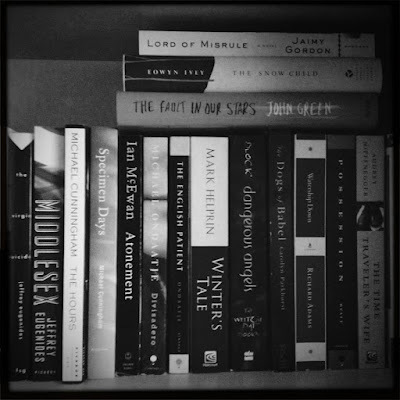 We intend to get together more than once a year, but it's hard to coordinate with everyone's busy schedules. This time there was a great turnout, and Boca got to meet more of her friends and very possibly family from The Humane Society of Grand Bahama. She knew Ellie from last year, got to see Fig and her favorite person from Pints for Potcakes last month, and met several new faces: Kenna, Judah, Finn and Abby. It was amazing to see how they greeted the other potcakes as if they really did recognize one another. The photo above is poor quality, but I had to include it because of the sheer joy in Boca's bounding leap. 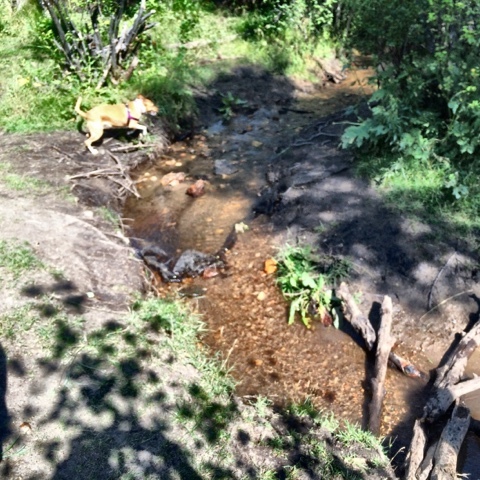 I let her off-leash next to the stream with the other dogs, and she took off in gleeful circles splashing in and out of the water. Then she demonstrated that her recall was not quite as good as I thought it was in such a fun environment, and considered taking off on a hike of her own. 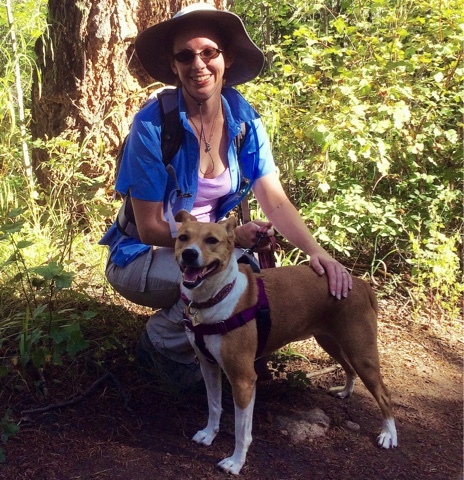 I re-attached her leash for part of our group hike, then let her off again once we were more of an established unit, and by that time she stayed close and checked in frequently, which I praised her immensely for. 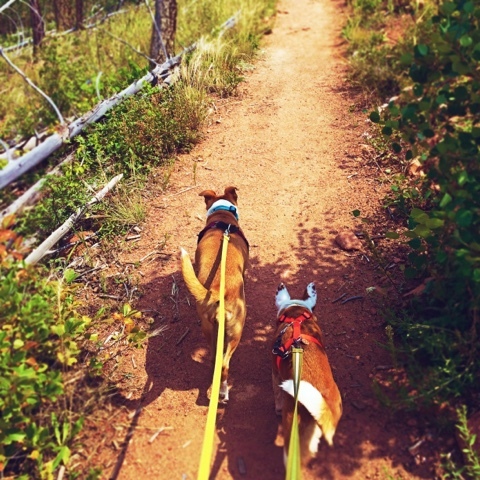 After our hike we returned to the fenced area to let the dogs rest and socialize more. The number of other dogs in the meadow area ebbed and flowed - at one point it was a little too chaotic for my taste, and Boca did get intimidated by a couple of large dogs. 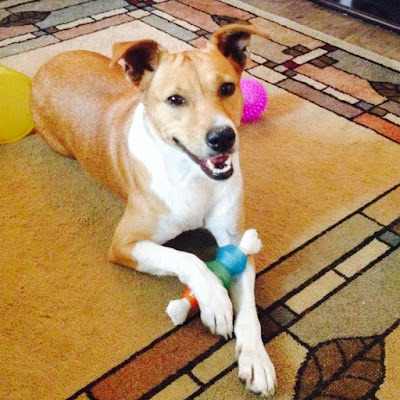 She has very good social skills overall - no doubt from living communally with so many other dogs at the shelter yard. Boca looked at me like I was slightly crazy on Sunday morning when it was time to take a drive again - she was perfectly happy to sleep all day and recover from the Goose Creek Hike - but I think she had one of her best days yet. 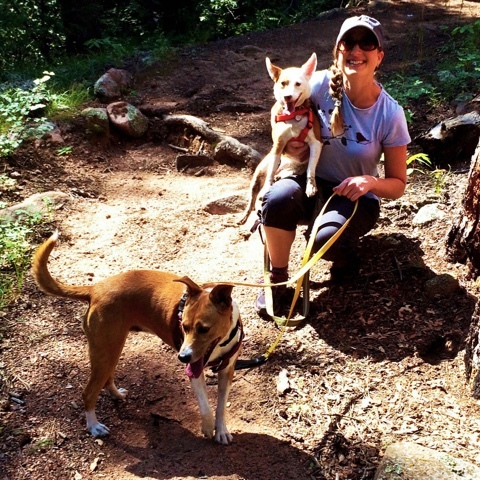 Elk Meadow has many different options, from fully fenced wooded areas to miles of off-leash hiking trails. The smallest fenced area is an open meadow on a hill, the perfect place to relax and wait for friends to arrive. Boca plopped down happily in the sun with her frog-legs splayed out behind her, much to everyone's amusement. Later she explored the perimeter in the tall grass with Ellie, engaged an adorable Bernese puppy in play, dug a giant hole, and chewed up a tiny stick that she found. 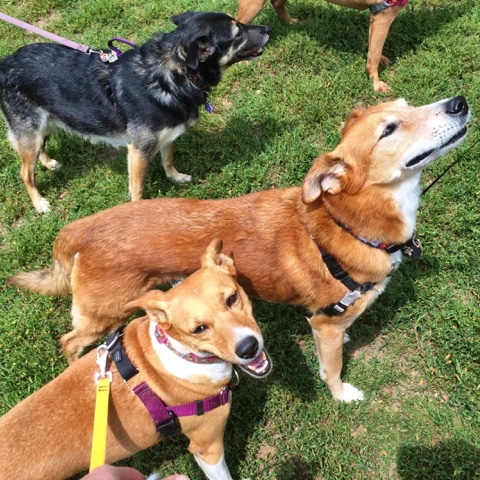 I loved meeting the other potcakes - such a sweet, easygoing group of dogs - and a wonderful group of people. It's a beautiful thing that a group of formerly unwanted dogs from an island in the Atlantic can find loving homes and unite a bunch of strangers thousands of miles away. 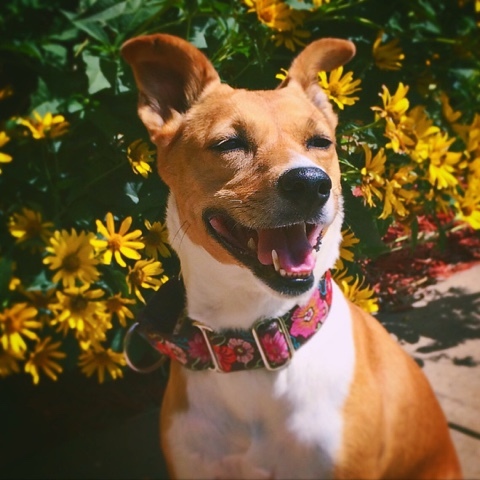 These cheerful flowers are the perfect backdrop for Boca's sunny disposition. Boca has had a very busy summer with lots of social engagements. 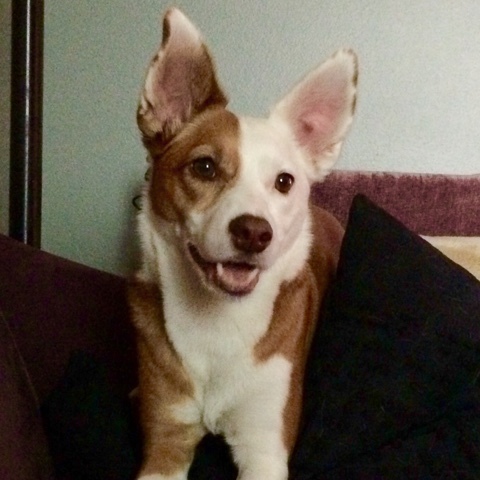 When I adopted Ruby, I was hoping that she would be a dog that could go everywhere with me, but due to her reactivity that did not turn out to be the case. 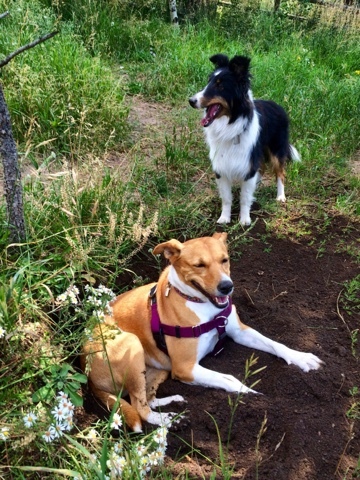 We've found other ways to have fun together, such as trick training, and I feel so lucky to be able to take my placid potcake on doggie dates. 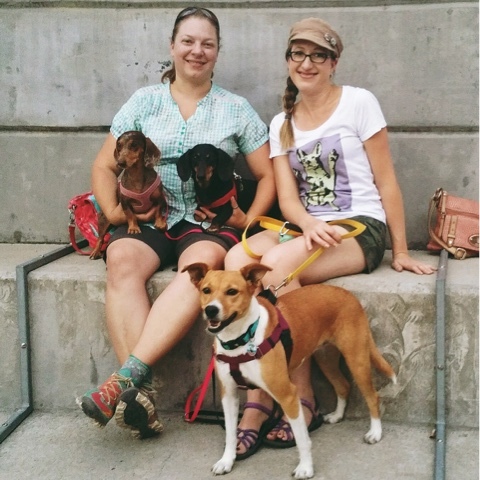 When I learned that Jessica from You Did What With Your Wiener (my favorite blog name ever) would be traveling through Colorado, I was so excited at the opportunity to meet her, Doggie Daddy, and star adventure dachshunds Chester and Gretel. We decided to rendezvous at Denver Beer Company, since it had high ratings on dog friendly destination sites. I'd never been there, and I think on a normal weeknight it would have been perfect, but there just so happened to be a race that evening so it was...overrun...with participants. We grabbed pizzas from a food truck and walked to a downtown park to eat and chat. Boca was great with Chester and Gretel, and I so enjoyed getting to know Jessica. All of the doggies got "pizza bones" - I couldn't resist Chester's stealth determination or Gretel's adorable face. The time passed too quickly, but the adventurers had to get back on the road toward their goal of tackling a Colorado 14er (spoiler alert: they did it!). Hopefully we will get to hang out again sometime. 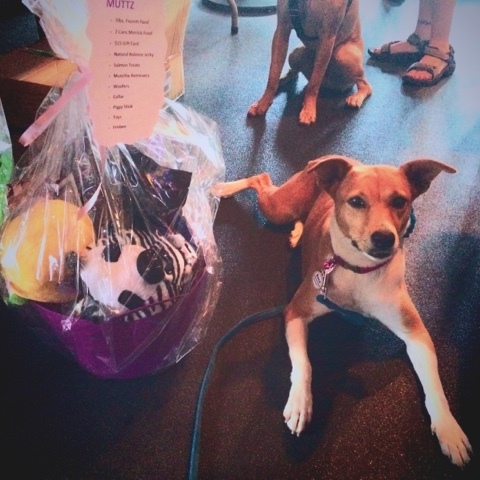 In mid-July, we attended Pints for Potcakes, a fundraiser set up by some local potcake fans to raise money for The Humane Society of Grand Bahama, the shelter who saved Boca from the streets. On the day of the event we had severe thunderstorms shortly before it was time to leave. I debated taking Boca after all, but I had been looking forward to it for months and knew some of Boca's fans were excited to meet her. I checked the radar and it seemed like we were headed for clear skies, so I put Boca's Thundershirt on for the trip and away we went. I felt like I was with a celebrity when we walked into the Ugly Dog Sports Cafe and I heard "It's Boca!" from several directions. That's the way it goes when your dog is cooler than you. We joined some lovely people at a table and met some of Boca's fellow HSGB alumni. The dogs were all friendly and mellow - it almost seemed like they recognized each other (and it's possible some of them did). Boca picked a favorite person and settled practically in her lap at a booth for the majority of the time. I placed some silent auction bids and ended up winning an awesome gift basket. The bar staff were all incredibly accommodating and they had a nice set-up with a fenced dog play area on the patio. It was delightful to connect with more Colorado potcake people! One of the best parts of this summer has been reconnecting with my childhood friend, Wendy. 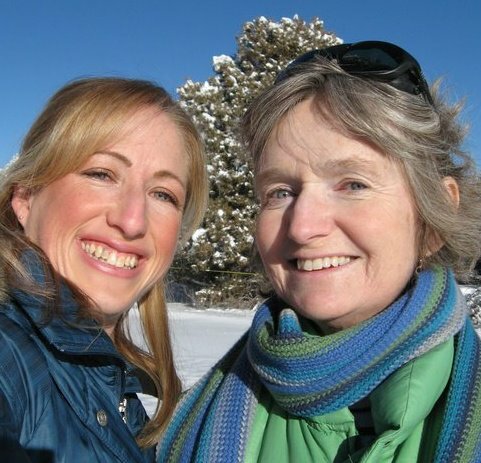 We both grew up exploring nature and riding horses in southwestern Colorado, but had lost touch for over twenty years. Thanks to the wonders of technology (i.e. Facebook) we found each other again and we have been getting together several times a month. Our first hiking attempt was rained out, but we were determined to make it work this past weekend. 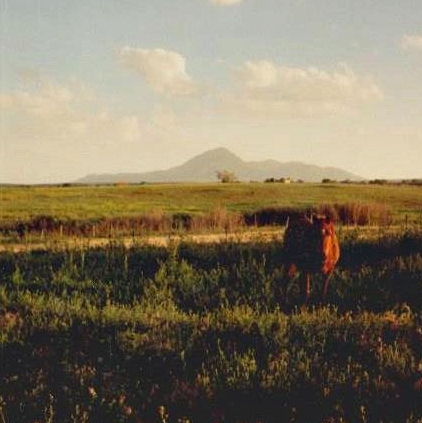 We settled on Meyer Ranch Open Space, a short drive from the city. I knew it would be difficult to manage Ruby since our local trails can be extremely busy on the weekends, so she had to stay home again. Boca was still lounging on my bed when it was time to leave - not the picture of a dog ready to go hiking! 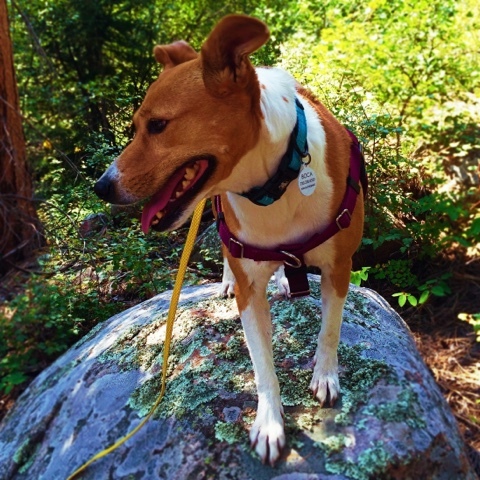 She was quite nervous as we started out, which surprised me, but I realized she hasn't really been to the mountains without Ruby and I think some of her street dog survival skills were kicking in. She was very alert and somewhat hesitant - she definitely wanted someone else to be the trail blazer. I was happy to see her relax mid-way through the hike. Her tail came up from between her legs and she regained her merry amble that I love so much. We passed quite a few dogs and her greetings were polite and appropriate each time. I realized just out just how out of shape I am as I huffed and puffed up the hills, but so enjoyed being out among the aspens with my old friend and my good dog. I feel bad leaving Ruby behind on these excursions, but my dad keeps her company and I always make sure she gets some extra attention such as a solo walk or play session when I get home. She is ever so glad to have us back and likes to jump on Boca and sniff her all over for the olfactory details of where we've been. Now that I'm familiar with a few more trails nearby, I plan to take her up on one of my upcoming Fridays off when it's less crowded and my dad can join us. 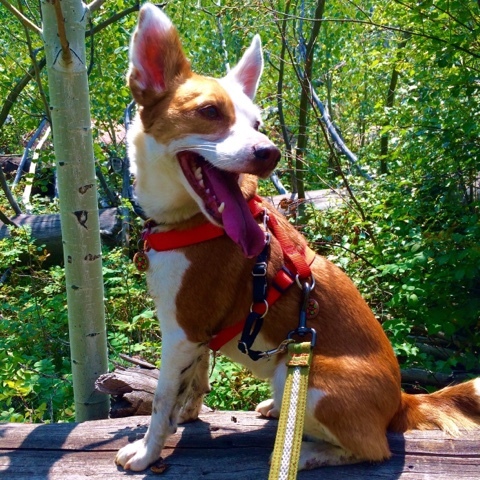 This weekend we have another hike planned with the Colorado Potcake Meetup Group, where Boca will get to see some of her friends from the fundraiser again. It seems like the summer always goes by too quickly, but we've managed to fit in a lot of fun, and I'm especially proud of my Bahama girl for being game for almost anything and becoming a social butterfly. I was nominated by It's Dog or Nothing, Forest Poodles, Dog Mom Days and Groovy Goldendoodles (all blogs that I adore) to participate in "8 Photos of Happiness," a tag challenge created by Ariel's Little Corner of the Internet, and what better time to do so than Wordless Wednesday? 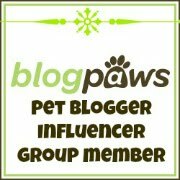 I have enjoyed seeing everyone else's photos, especially those that may not be dog-centric, since most of us as pet bloggers actually do have other interests, so I'm going to share a few like that as well. Silliness on Ruby's Gotcha Day. We loved each other from day one. Taken before I officially adopted Boca but it's clear that she was already home. 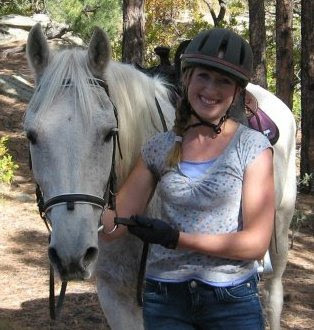 The best day with my horse Coro - a group ride through canyon country. 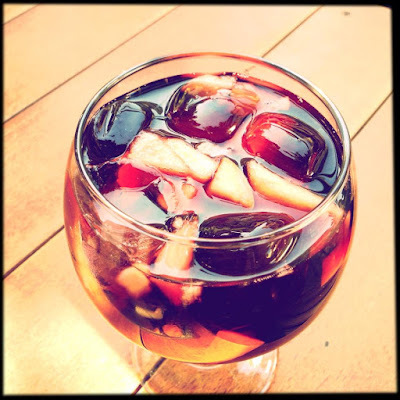 My first glass of sangria in Spain - this takes me right back to the streets of Sevilla. 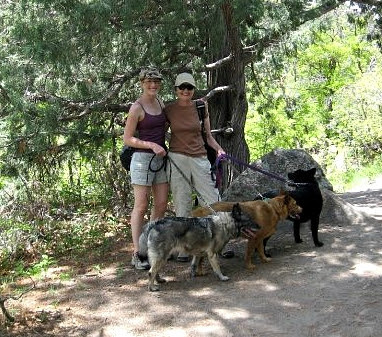 Hiking with my mama and three good dogs (Lasya, Scout and Freya) in 2009. 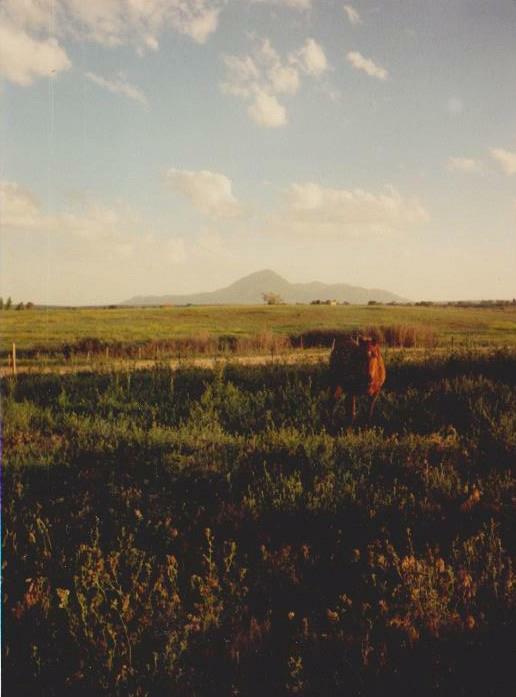 View of Ute Mountain and my first horse Tinker in Cortez, Colorado where I grew up. I'd like to nominate Dachshund Nola, Nala the Wonder Dog and Oh Melvin to share eight photos of happiness. This post is sponsored by Open Farm. 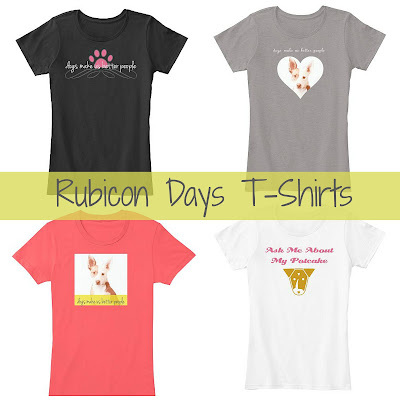 I am being compensated for helping spread the word about Open Farm ethically produced pet food, but Rubicon Days only shares information we feel is relevant to our readers. Open Farm is not responsible for the content of this article. 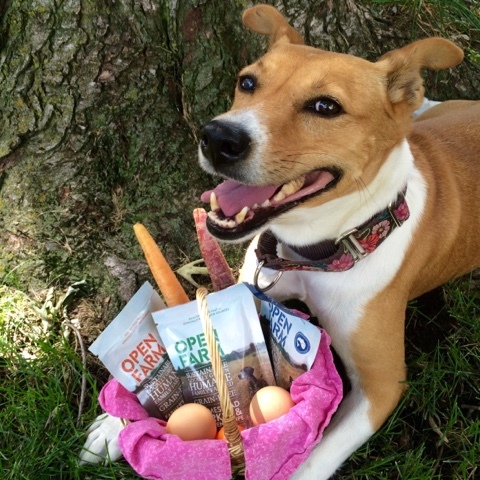 Open Farm is not a vegetarian dog food. I don't believe in feeding a vegetarian diet to dogs, because their ancestry and physiology suggest that they are primarily carnivores. 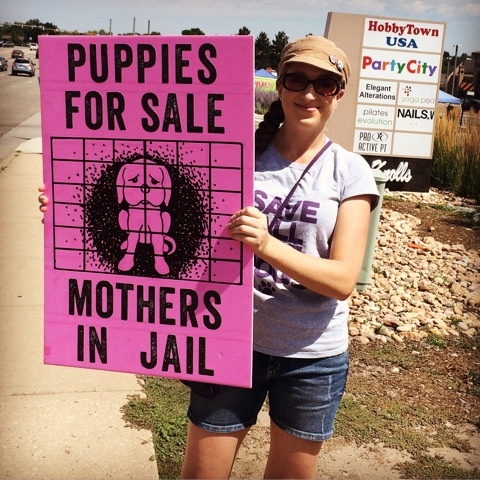 Last weekend I attended my first pet store protest organized by a local group called Puppy Mill Free Colorado. I had been following the group and meaning to join them for a while, but seeing the Dog by Dog documentary gave my procrastination a kick in the rump. While I knew that the protest group would provide signs, I thought that creating my own would both make the protest more personal for me, and solidify my determination. I hadn't been feeling well all week, but it was only an hour of my time, and I couldn't back out at the last minute if I put the effort into making a sign. Plus, I had the great resource of my artistic dad, so we made it into a family project. We stopped at a craft supply store and got foam board and adhesive letters, and all the way home I brainstormed my slogan. I was delighted to come with something rhyming and succinct. My awesome dad drew the picture of the sorrowful caged dog and helped me with the lettering placement - straight lines are not my forte. My dad has always been on my side with my animal welfare projects, contributing his practical and creative sensibilities. We finished the sign just a little while before I needed to leave for the protest. I was a little nervous - I didn't know what to expect. My dad told me as I headed out the door that he was proud of me but that he would be embarrassed to do something like that. I responded that when it comes to animals and advocacy, I'm an extrovert. I may be a naturally shy and quiet person, but dogs help me find my voice, whether it's chatting about them with strangers or speaking up for their welfare. As I parked my car and walked to the busy corner with my sign, I was welcomed by the other protesters. There were six of us in all, and we lined up with our signs facing the oncoming traffic and people that would be turning into the shopping center. I could see the puppies in their glass enclosures through the windows of the pet store. I spent some time reading online reviews of the store, and was horrified to see that even many of the "positive" reviews included tales of puppies sick with respiratory infections and parasites, as well as proof that the "reputable breeders" are in fact large-scale commercial operations. 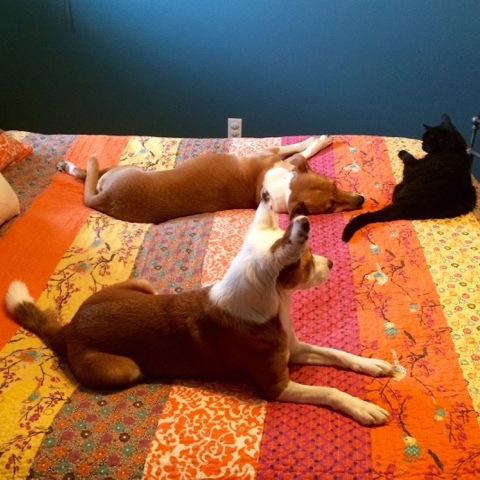 Perfect Pets is in Centennial, a suburb south of Denver. There have been legislative attempts to ban the sale of puppies in pet stores in Centennial but they have unfortunately failed, which is why it's imperative that education continue, so that enough people understand the reality behind the cute, instantly-obtainable puppy. As the store opened a few cars pulled into the parking lot. 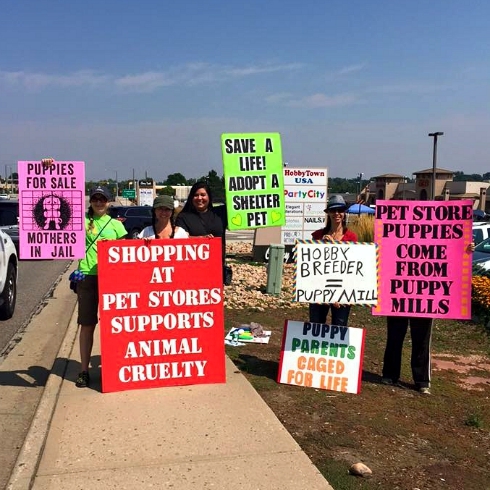 The protest leader approached the would-be customers politely, asking if they'd like information about why they shouldn't buy from a pet store and adopt from a shelter instead. The reactions were mixed - some ignored her completely, one guy said he "didn't want to hear it," others said no thank you. A few took the handout, and best of all, two families actually got back in their cars and left Perfect Pets without going in after speaking with us. The most heartwarming of all was a young man with his kids, who were obviously excited to pick out a puppy. The young man was completely receptive to the information, and was especially concerned when he found out that pet store puppies often come from the unhealthy conditions of puppy mills. He actually said "Come on, let's go get a good dog from a shelter!" as they piled back into their car. I could have cried from happiness, and that fueled our enthusiasm for the rest of the morning. It was one of the hottest weekends we've had this summer, and yet I didn't mind at all standing on the sidewalk in the sun, waving and gripping my sign. I felt an immediate camaraderie with these five other women who took time out of their weekend to effect change for animals. It's a message I deeply believe in, and every person that whooped or honked from their car meant another person that gets it. Some of the drivers that read our signs as they passed had never thought about it. Others may have thought we were "crazy animal rights activists" harassing a perfectly acceptable business. What mattered the most were those two families that made another choice that day, who didn't buy a puppy whose mother probably spends her life in a wire cage with no vet care, affection or shelter. That's the reason I'll be back with my sign another day, several times a month. No one left with a puppy from Perfect Pets during our protest, and I hope that little by little, these profit-driven commercial breeders will find fewer and fewer ways to peddle their shameful wares. In the meantime, I'll be out there aspiring to change just one more mind. 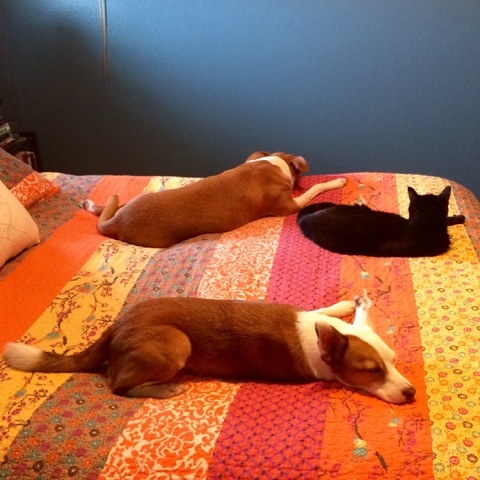 And deign to share her space with two ginger dogs. I didn't expect to be sharing sad news today, especially not the sudden loss of one of Ruby's friends. 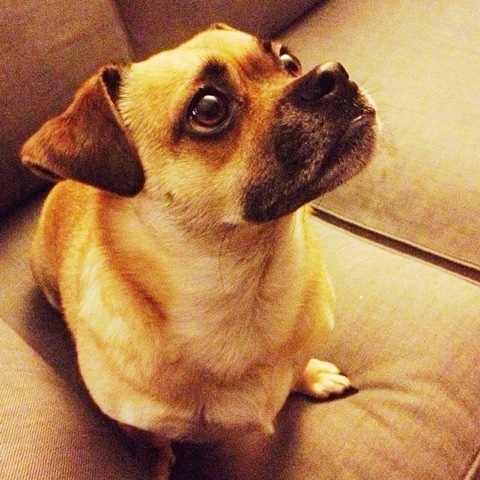 Cosmo was a Pug/Chihuahua adopted from Denver Dumb Friends League, the same local shelter that my Norwegian elkhound, Freya, came from. I loved Cosmo's jaunty little trot, his soft butterscotch fur, his big baby eyes and his silky folded-over ears. He was an impressive fetcher, a consummate beggar for Chinese food, and his "speak" trick was the most hilarious thing ever, growling gutturally with his mouth open. I called him Cosmonaut. Before getting to know Cosmo, I'd mainly been around bigger dogs - what I considered "real" dogs. Cosmo astonished me with his intelligence and intent focus on his person. He learned tricks easily and seemed to understand a good deal of what you said, tilting his head back and forth in that irresistible way. Cosmo played a significant role in my adoption of Ruby, since I wanted a dog similar in size so they could be playmates. I'm so grateful that he changed my thinking about smaller dogs. The two of them had a lot of fun together after some initial skirmishes - chasing each other in madcap dashes around the sofas, tag-teaming the flying disc at the baseball field and crashing contentedly after wrestling matches. Dogs never stay long enough, but when their lives are cut short at a young age it seems all the more unfair. 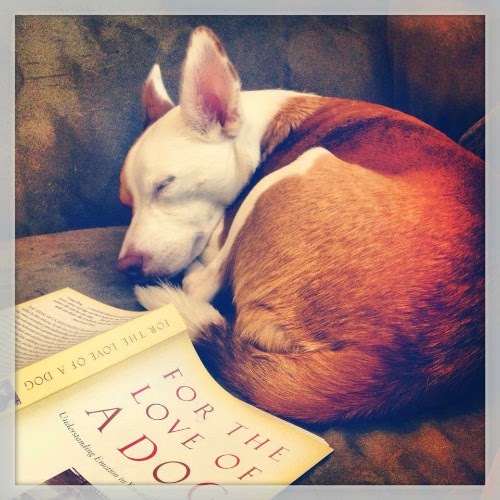 In agreeing to share our lives with animals, we are signing a certain contract for heartbreak. I like to think it splits our hearts wider open, every one we love. I'm so very sorry for what Cosmo's dad is going through, and I will miss that cute, charismatic boy. This is the face of a happy, engaged dog. It's my favorite face. 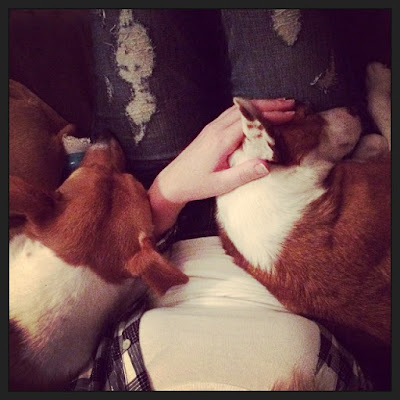 Last month, for the Positive Pet Training Blog Hop, I talked about why I'm a bad dog trainer so this month I wanted to explore the flip side of that. Today also happens to be Ruby's 2nd Gotcha Day, and of the myriad ways she's changed my life, one of the most important is all she has taught me about dog body language, behavior and training. While we're nowhere near perfect, we've come a long way in our communication and understanding of one another. I've gotten her through some fears, improved her reactivity to most pedestrians and cars, and implemented management strategies when and where I've needed to. Ruby is a much happier dog than she was two years ago. She wags her tail more often and has the confidence to investigate things she's afraid of. She trusts me to keep her safe and I know our limits. I thought I would share a few examples of things we've improved on lately and what skills I incorporated to do so. When I started trick-training beyond the basics, I really wanted to teach Ruby to cover her face with a paw. I would call the trick "are you shy." The step-by-step instructions in my trick training book suggested sticking a piece of tape or a Post-It note to the dog's muzzle, then marking and rewarding when they pawed it away. Ruby quickly caught on to this and just as swiftly let me know that wasn't going to work for her. She found the sticky note mildly aversive and started avoiding me when she saw I had it in my hand. I tabled the trick for a while, but this spring I introduced it again, breaking it down into smaller steps. I decided I would use DS/CC to change her association to the sticky note, marking and rewarding each time she allowed me to touch her with it, beginning with her neck. As I started touching the sticky note to her muzzle briefly, she started pawing at it, allowing me to mark and reward and thereby capture the very behavior I was looking for. I realized I didn't even have to use the sticky note, and could illicit the pawing action by gently touching her neck or nose. Soon I could fade the physical cue and started using a hand signal (covering my own nose with my hand). This trick still isn't completely solid, but we've made significant progress on it simply by stepping away from it and approaching it in a slightly different way. Ruby is a very sensitive dog. She is uncomfortable with restraint and does not like the sound of metal (keys, silverware). This makes putting collars and harnesses on with their accompanying tags, snaps and buckles clinking a bit of a challenge. Ruby adores going for walks and knows that her gear is a requirement for venturing out, but if something gets dropped on the floor by some klutzy Ginger Sister guardian or a boisterous Boca bowls her over, we have a setback. What I've learned works best is letting Ruby come to the harness, rather than the other way around. It's less threatening for her, and by giving her the option to "put her stuff on" when she's ready, I've involved her in the process rather than forced it on her. She understands that the sooner the harness is buckled, the sooner the fun begins, and she will nearly always put her own harness on by poking her head through if I just give her a moment. This is the big one. As much as I love trick training, and as much as I appreciate the importance of obedience (most especially with recall, something we will probably always struggle with, given Ruby's high prey drive and our lack of outdoor space to practice), what I'm most interested in is my relationship with my dogs. I want one based on trust and understanding, with both parties getting a say and striving to communicate more effectively. Last weekend one of our resident rabbits spent some time sitting under the hedge next to my front window, much to Ruby's delight. She normally can't see out of the windows since they are covered with window film, but we've been opening them for the cross-breeze on these cool mornings and evenings. She spent several hours perched on the back of the loveseat, watching out the screen, quivering with excitement, wagging her tail from side to side and fantasizing about how it would taste, no doubt. One evening she jumped onto the back of the sofa, glanced at the curtain, then looked pointedly at my dad and quietly grunt-barked at him. We both knew exactly what she meant - she wanted the curtain and the window open so she could see her rabbit! Would some consider that demanding? I considered it incredibly smart and kind of amazing - another species communicating her desires to another. These moments are outside the definition of training in a traditional sense, but they solidify my determination to keep learning and keep listening, which is what training means to me. 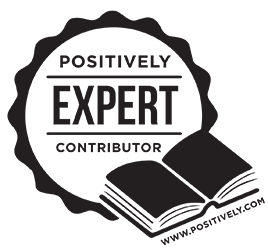 This post is part of the Positive Pet Training Blog Hop, hosted by Cascadian Nomads, Tenacious Little Terrier and Rubicon Days. The hop happens on the first Monday of every month and stays open for a full week. 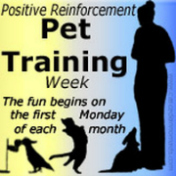 Please join us in spreading the word about the rewards of positive training!